Using the work of our hands to serve the kingdom of God. Knitting gives me great pleasure so it is no surprise that I truly love to knit for other people. Knitting is also more fun when you do it together. So if you are not part of a knitting ministry, I encourage you to join one or better yet start one. To start you off, here are some easy (and not so easy) patterns that I have designed to use for knitting ministries. They will make wonderful gifts that are a great way to brighten the life of the shut in, the sick or those who just need some encouragement. Most of the patterns are available as pdf downloads. The patterns are also available on Ravelry. If you are on Ravelry, I would appreciate it if you linked your project to my pattern. It is fun to see who is knitting my patterns. This material is protected by copyright and all rights are reserved. You are free to use the patterns for personal, non-commercial and non-profit use. You may also use them for knitting ministries or knitting classes as long as the classes are offered free of charge. You may not offer the copies of the patterns or finished products for sale. For full copyright information see the bottom of the page. These are great small projects to use as a way to show someone they are special. The gift of a hand knitted item will warm the body as well as the heart. Add a prayer with each stitch for an extra blessing for the recipient. This is a very easy ribbed scarf that would work for a quick gift for that special hunter or for anyone if you use some color besides the camouflage. This is my first sock design. While this one is not as easy as the other patterns, it would still be a wonderful gift for someone you want to encourage. I have knit many socks that had the prayers knit right into them. This is a simple, very fast knitted lap-sized throw perfect for use in nursing homes. It is also a wonderful size to cover one's legs while watching TV, doing handwork or sitting at the computer. Using two strands of yarns, cast on 40 - 50 stitches (or the number of stitches to make the desired width). Knit every row until throw is approximately 36 inches long or until you have about 4 yards of yarn remaining (or 4 times the width of the project). Bind off knit-wise. This is very fast project. You can use two different colors of thread or a single color for both strands. If you don't have a lot of yarn you can use a single strand. You can add fringe if you like but it is recommended that you not put fringe on throws for nursing homes or people in wheel chairs. Finished dimensions are approximately 20" X 36". The size will vary with your gauge and the size needle you use. 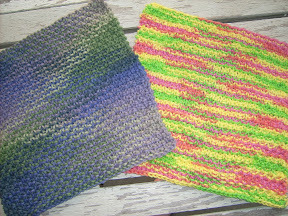 This easy shawl is quick to knit so it is a great pattern for gifts or a prayer shawl ministry. You will need 1 to 2 skeins of bulky weight yarn like Lion Brand Homespun, Cast on 3 stitches. Row 1: K1 yo pm K1 pm yo K1 Row 2 and every even row knit across. Row 3: K1 yo slip marker knit to marker slip marker yo K1 Repeat Rows 2 and three until you have the desired length. Bind off loosely. One of my favorite things to knit is cotton cloths. I use them for washing my face because they are great for exfoliating the skin but they also work equally well for the dishes. These make a quick and easy gift. 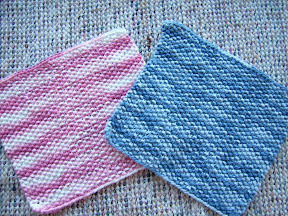 Knit a couple in white or pastels, add a nice bar of luxury soap and a scented candle for a wonderful spa set. Give several with a bottle of baby wash as a shower gift. Or wrap it around a bottle of dish washing detergent for a great and inexpensive anytime gift. This is one thing you can never have to many of. The 7 inch size makes a great way to try out a stitch pattern. Here are several of my designs for your personal or gift giving needs. This design was inspired by the shawl that I knit for Ms. Emerald, one of the widows in our congregation. It was only fitting that I name the design for her. The pattern includes a wash cloth and hand towel patterns with written and charted instructions. All of the patterns on this page are offered free of charge but I also have a number of additional knitting patterns available for sale. The sale of these patterns helps provide the funding to operate this site. If you would like to see these patterns, visit Tabitha's Heart Designs. I’m sure most of us have been the recipient of some kind of card at one time or another in our lives. 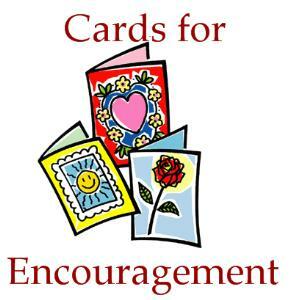 Cards sent by someone who wanted to cheer us up, encourage us, show their support for us, sympathize with us, say congratulations, or maybe it was just a brief note of thanks. Remember how good it felt to know that others wished us well and were thinking about us? We, as women, have been given a unique gift, more so than men, of nurturing and caring for others. We see things and feel things that our male counterparts don’t notice and stop to think about. God gave us that ability and we can use it for the furtherance of His Kingdom. Many women are not able to do things for others that they would like because of time restraints or health problems, etc, but having a card ministry is something every woman can do, regardless of the ‘season’ of life that she is in. How do we begin a card ministry? Let’s start at the beginning by asking and then answering the most commonly asked questions. Where do I get the cards? Cards come in all sizes and shapes and say just about anything you want them to say. Cards can be found in the grocery store, drug store, mall, department stores, and some churches even make them available for their members to use and send. You can use your computer to make cards. You can make cards without a computer. You can also buy cards individually or in boxes. What about the ‘cost’ of cards? I will be the first one to admit that there are absolutely wonderful “just right for the occasion” cards out there that I can not afford. I have two options here. I can walk away and just not send a card because they are so expensive or I can meet the challenge head on and go to a less expensive card. Some of the boxed cards are really pretty and I can go this route or I can make my own card. (I have seen some really beautiful hand made cards.) I can also use my computer to make a card. What about postage? There is simply no way around this ladies. If you send a card through the postal service, it will require postage. Now before you say I just can’t afford it, think about how good it feels to receive a card. Think about what good you can do for the kingdom of God. Think about what you could give up over the course of a week that would enable you to be able to send a card or two. You will have to determine what you can afford to do. To whom do I send cards? This one is easy! Listen to the announcements when they are made at church services on Sundays and Wednesday nights. The announcements usually mention those who are sick, in the hospital, having birthdays, celebrating anniversaries, etc. Who do you personally know that is sick, going through a hard time, or has reason to celebrate and rejoice over some good news or an event in their lives? Who do you personally know that needs a little cheering up, has lost a loved one, or who you want to just say “I’m proud of you" to? Jot these names down as they come to mind and you’ve got your ‘who to send to’ list. How do I keep all this organized? Find a basket or container and put the following items in it: cards, envelopes, pen, small, spiral notebook (This is to keep up with who you have sent a card to and when.) For those whose situation may need more than one card, this will help you to space the card sending out at appropriate intervals. You can also put the addresses of all the local hospitals/nursing homes in this notebook. This will keep you from having to continually look up these addresses. ), postage stamps, and a small calendar (The calendar can be used to note birthdays, anniversaries, and other special days that you would like to send a card for.). Keep all of these items in your basket and put it away until you get ready to use it. You will then have everything that you need at your fingertips when you get ready to send a card. One more little tip on organizing your “card sending ministry” ....set aside a certain day each week and make it your “card sending day.” Send all the cards you are going to send for that week on this day (when possible). This will keep you from having your card sending supplies out at all times and will add some semblance of order to your ministry. O. K., we’ve got the ‘how to’s’ of beginning a card ministry, now let’s get started and ‘brighten’ someone else’s day! The story is told of a preacher in a small European village. He was greatly loved by the people, and they believed he had an especially close relationship with God. He disappeared every Friday and could not be found for several hours. The villagers boasted that during those hours he ascended to heaven and talked with God. There was a newcomer to that village. He was a skeptic who made fun of the faith of all the other people. He got increasingly irritated by all the claims about the minister, and so he determined to find out where he really spent Fridays. So he hid near the preacher's house. He watched as the preacher rose early, spent time in prayer, and left his house in the clothes of a peasant. The young skeptic followed the old man from a safe distance. He watched him cut down a tree and chop up a large stack of firewood. He continued to watch as he made his way to a shack in the poorest part of the village and stacked the wood. It was the home of an old woman and her sick husband. After leaving the couple enough wood to last them a week, the preacher quietly returned to his own home. The villagers were startled the next Sunday when the young newcomer was in church. They were even more surprised when he became a Christian shortly thereafter. He thought highly of the church's godly minister and -- upon his death -- he became his successor. For the rest of his own life, whenever he heard one of the villagers speak of his predecessor and say, "On Fridays he would ascend to heaven," he would add softly, "If not higher." Jesus said, "By this all men will know that you are my disciples, if you love one another" (John 13:35). We seem inclined at times to try to prove our discipleship by church membership and doctrinal correctness. While those things are important, the real proof that we know God is loving and serving unselfishly. Food for the hungry, shelter for the cold, companionship for the lonely -- that's the way of Christ. It's also the best way to answer skepticism and unbelief. We should never do our righteous acts to be seen by others, but we know that our upright deeds -- even the ones done in secret -- are being watched. If you actually know God and walk with him, someone who is watching will discover it. That person may want to learn the secret of such a life and may come to know Christ as a result. The best answer to skepticism is often not argument but demonstration.